Here in Cannon Beach, today begins our annual Earth Day Celebration, the 12 Days of Earth Day, , kicked off this morning on the beach @ world famous Haystack Rock. The morning event was coordinated by Nala Cardillo, Director of the Haystack Rock Awareness Program, with assistance from the kids at Cannon Beach Elementary School and the Cannon Beach Day Care Center. 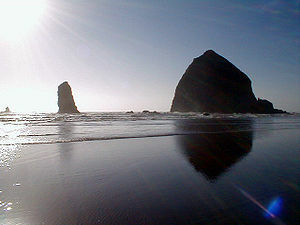 http://www.twelvedaysofearthday.com/ They welcomed the Tufted Puffins back to Haystack Rock. As of a few days ago, sadly no puffins had arrived. Too their demise I have a suspensions that some of the same factors that contributed to the death of Orca L-122 may have been at play in this case as well. Note I said may have, since they like Orica’s depend on diving to secure their food each day. They mate for life and have very strong family bounds, raft together during the winter and just prior to establishing their nesting colonies on preferred offshore sea protected rocks as is the case @ Haystack Rock. I might add this is best place for observation in the lower 48 states. It is also know that following breeding they move northward along the coast all the way to areas off Northern British Columbia. If you look at the tracking of Orca L-26 as posted in the following article you will see documentation of this whale being in the same vicinity that these puffins must pass through as they migrate. The puffins young after fledging are at this point too small to fly and are led by their fathers. Fortunately for the Orcas under the Marine Mammal Protection Act, they are protected, with the exception of Navy training and testing activities being conducted in the Northwest Naval Testing and Training Area. The puffins are not considered in the same fashion and being so small are undetectable based on the jargon in place to supposedly protect marine mammals. When I first came on board with the Haystack Rock Awareness Program as an original paid staff member in 1985, the numbers of nesting burros numbered well over 300 active sites, last year only around 30 if my memory is correct. My total point here is that something is changing which is causing a drastic reduction in marine dependent animals to be taking a nose dive. My major complaint rests with the naval use of sonar and detention of exploding underwater bombs. Their killing impact on all forms of life in the sea must be addressed. If you follow the link below to its conclusion you will join me along with thousands of other like-minded citizens, led by Ken Balcomb and so many others in asking for a complete investigation into the deaths of Victoria, Orca L-112.